In a portrait session, we are always after the “perfect” expression that shows off your pet’s personality and captures the essence of everything the owner loves about him. The perfect expression comes from an excellent connection with the pet. The good connection can come from the owner, the photographer, and the situation… but best if we have all 3. When searching for a photographer, you of course want someone who isn’t afraid of pets. You’d think this goes without saying but I actually had someone contact me b/c their past photographer was afraid of their pet and I guess that did not turn out too well! You also want someone who understands your pet and can bond with your pet quickly. Bonding and understanding animal behavior is very important b/c if the animal is not comfortable, there is very little chance to elicit a good expression and comfortable posture. 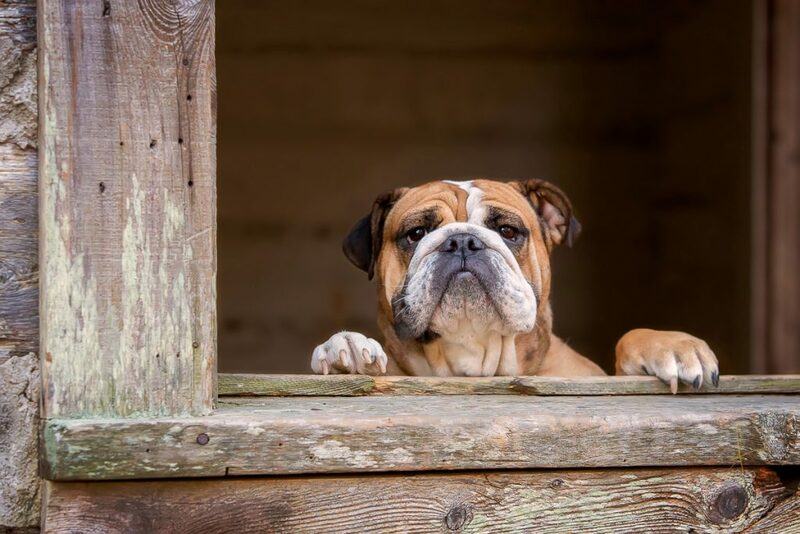 It is also imperative, as the owner, that you have a good relationship and bond with your pet. That is usually a given, but another consideration is that during the session, owners are not overly nervous or demanding on their pet. Pets quickly pick up on our emotions, and if they sense you are overly nervous or demanding, it can cause them to shut down. 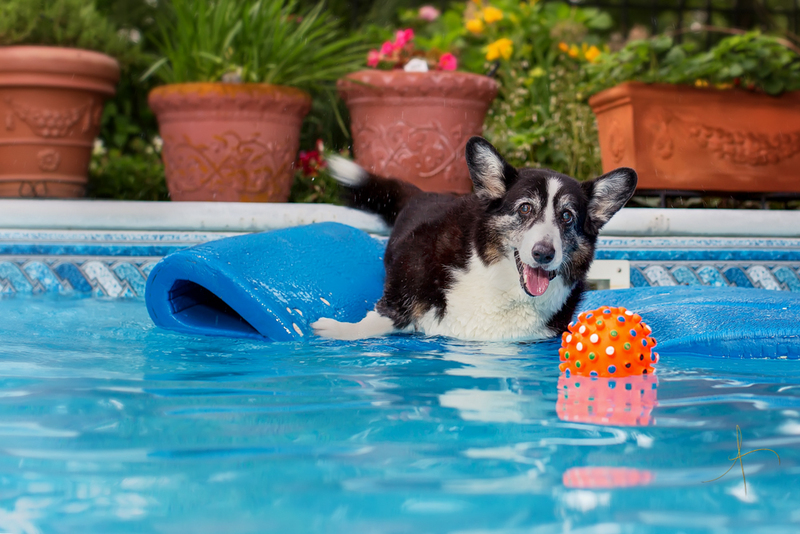 Try to relax and have fun as much as possible and your pet will too! I love capturing the love animals have for their humans. Having the human stand just out of frame is a great way to get the perfect expression. Have fun with favorite toys and memorable places. Here are a few tips that will help you capture personality with your own images. Keep you pet’s surroundings familiar. If your dog doesn’t go out in public much, don’t try to take your pet to a busy downtown location and have too high of expectations of excellent images. Talk to your pet with his/ her favorite words. Some might include “Do you want a treat”, “I love you”, “Are you a good boy”… anything familiar that elicits a reaction. You know your pet best! 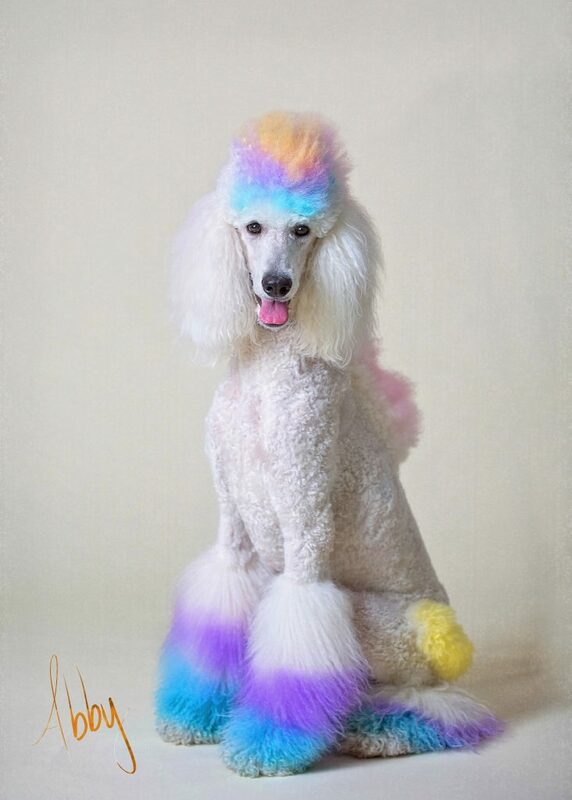 Let your pet have fun. 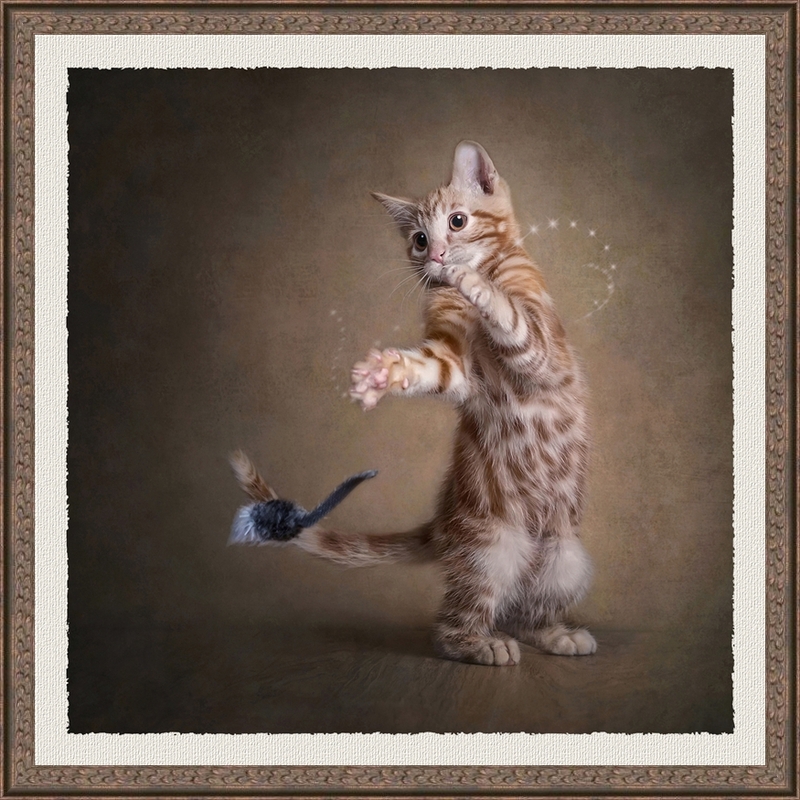 A great way to elicit an expression is to let your pet play with his favorite toy or chill in her favorite spot. I hope you enjoyed today’s blog. As always if you have questions, comments, or would like to book, don’t hesitate to ask! Contact me any time! Even cats can show a lot of personality with their favorite toy. 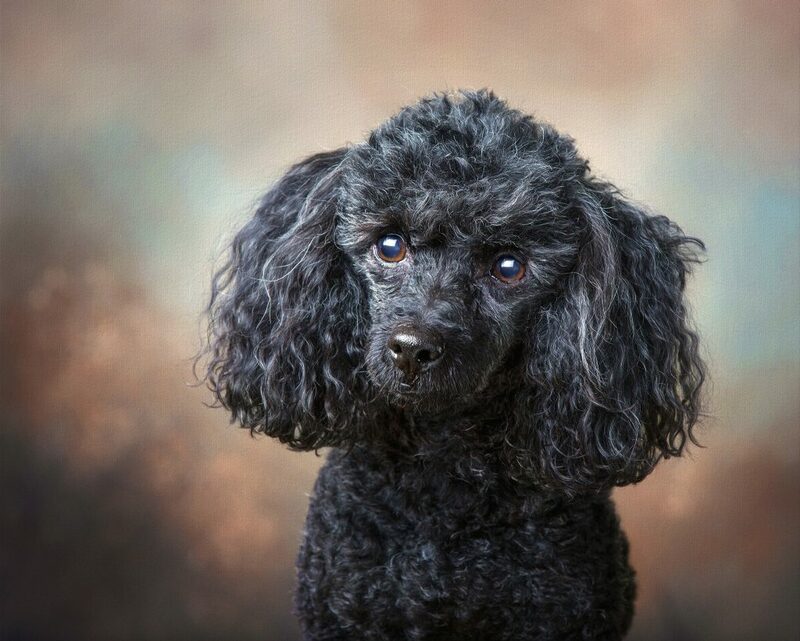 A lot of folks are afraid of having a portrait taken of their black dog…..They’ve usually tried themselves, perhaps with an iPhone or a consumer type camera… and their dog looks like a black blob of darkness. The chief complain folks have is that they can not see their black dog’s eyes. Ummm, You might be wondering….”Is that even a dog?” If you’re getting these kinds of results on your own, I can totally understand why you might be a bit apprehensive about letting someone else try. 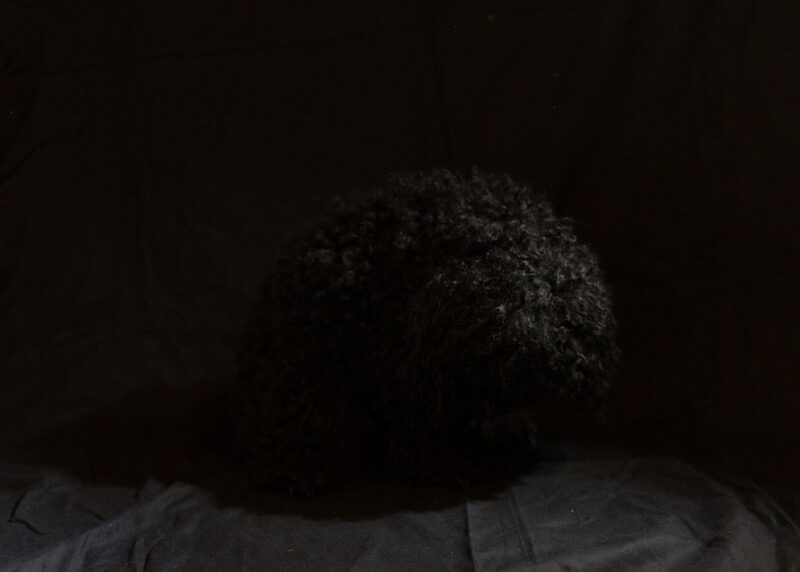 Working with black dogs takes experience in lighting…. 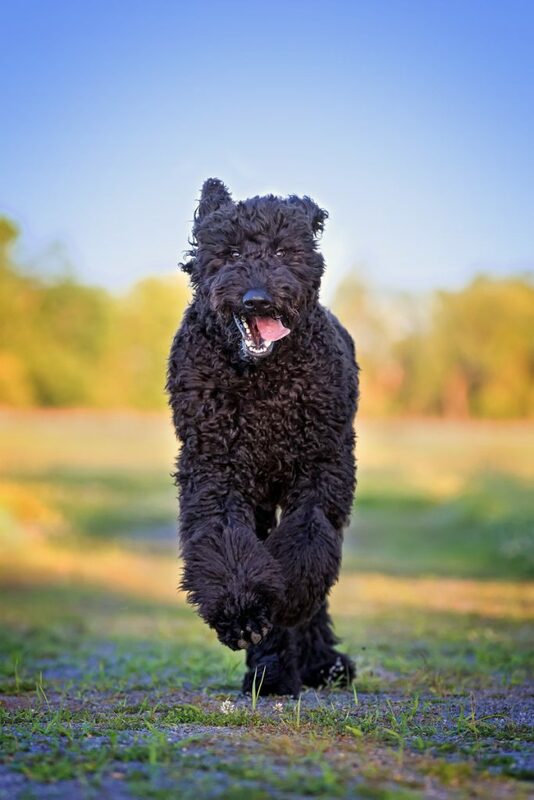 but leave it to us and you’ll 100% be amazed at what we can do for your black dog! 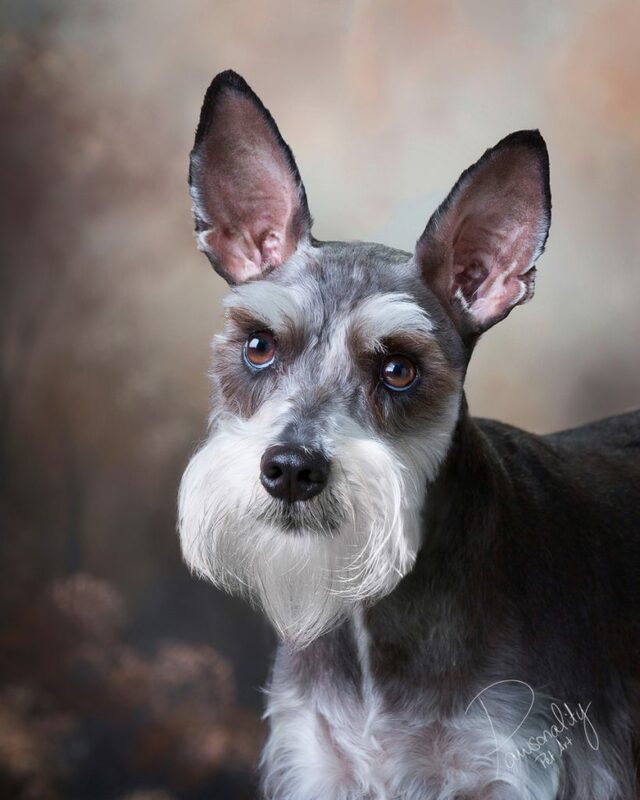 You can definitely expect to see his sweet caring eyes and expression, details in the fur, and her unique personality…. we promise. Question, Comment? If you’d like to inquire about a session for your black dog, click here. When it comes to pet photography, folks sometimes have a few fears or concerns…..”my dog just won’t do that”… I hear people say in passing. I’ve created this series to tackle concerns folks have. Today we’ll tackle the leash/ collar issue. 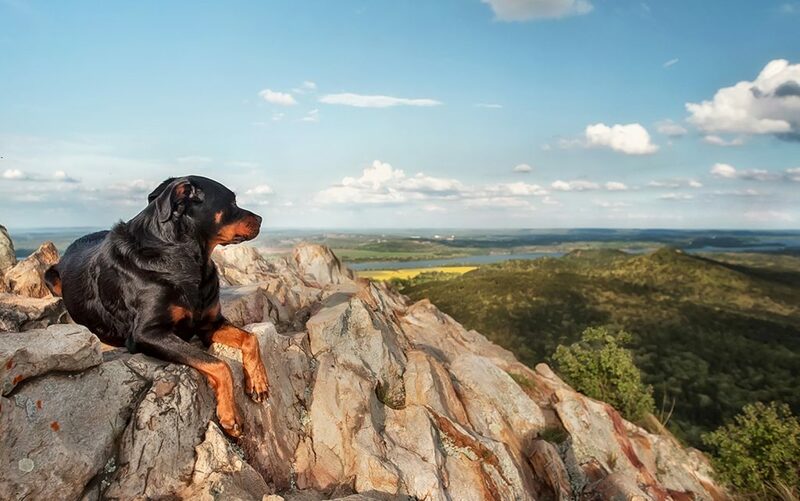 It’s normal and expected that many dogs can’t go out in a park or busy area without a leash. 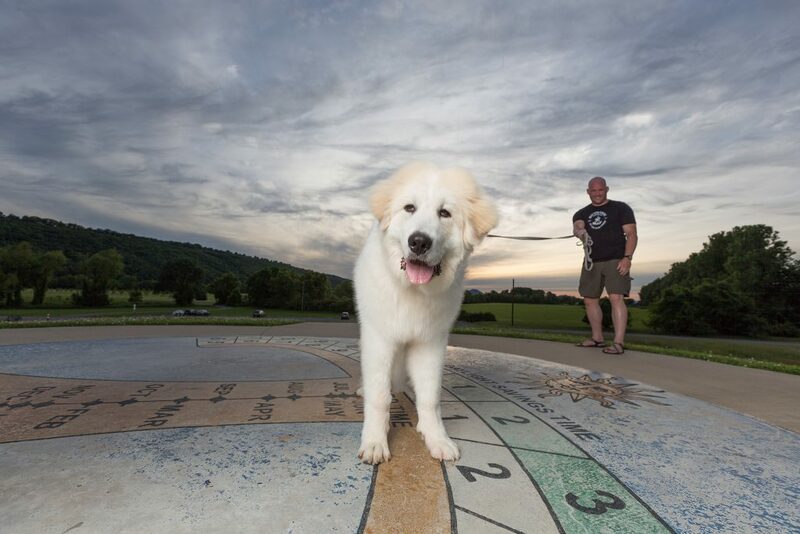 Most locations in city limits even require it, and a lot of people think this precludes their pet from a session. Good news: It’s not a problem at all. When folks book a session, I give them some special tips on finding a leash/ collar that is easy for me to remove. During the session I give instructions to the owner on where/ how to hold the leash to help both the pet feel comfortable and allow me to remove it in post processing. Check out this before and after of Cooper. Cooper had a great session. He was a rather calm boy but still had his puppy spirit! 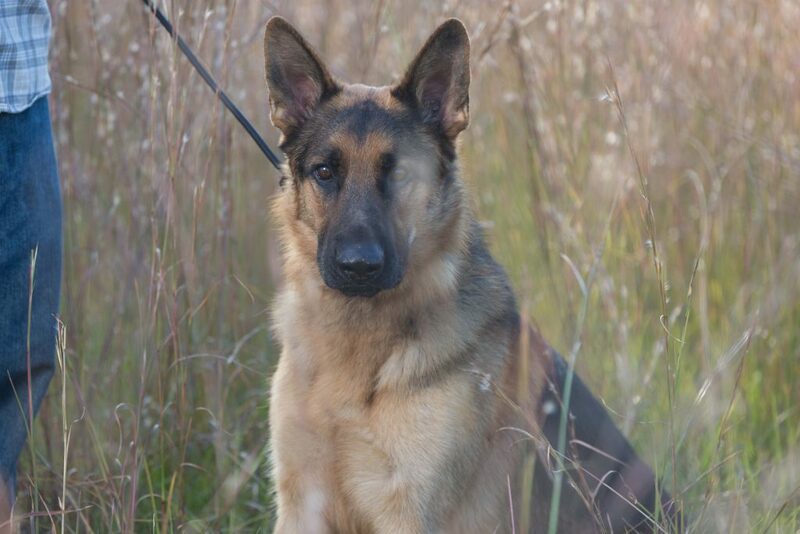 A leash helped keep him focused and ready, and allowed us to comply with local laws. Most importantly, a leash keeps pets safe. In this before image, you can see there are a lot of things that need to be removed: people, light polls, cars. Cooper looks great and his leash isn’t in the way much at all. His fur covers his collar making it no concern at all. Ta-Da. Cooper looks much better! He’s the center of attention now. We removed my handsome assistant, Cooper’s leash, the light pole and wires, as well as the cars and background objects. Check out this beautiful pup. GSD are such fun noble dogs to work with, but I can always expect a lot of energy and a spirited demeanor from this breed! 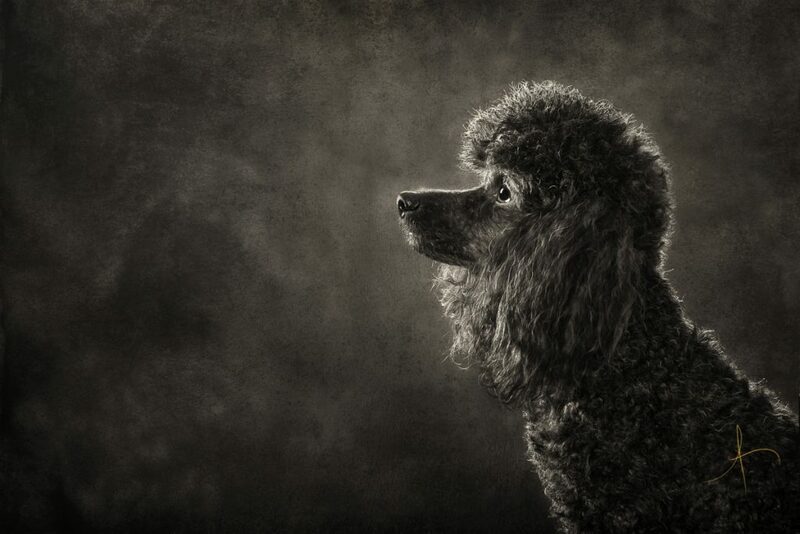 It’s no problem….in fact spirited dogs usually do really well showing off their personality in portraits. This guy was young still, if I recall correctly, about 2 years…so a good balance of stoicism and puppy energy. The park was pretty busy with other dogs, children yelling and people having fun. We kept him on a leash for everyone’s safety and to obey local laws. Notice in this before shot above, his owner, leash & collar were on. There’s also a good sized blade of grass in front of his eye…. sometimes that happens. 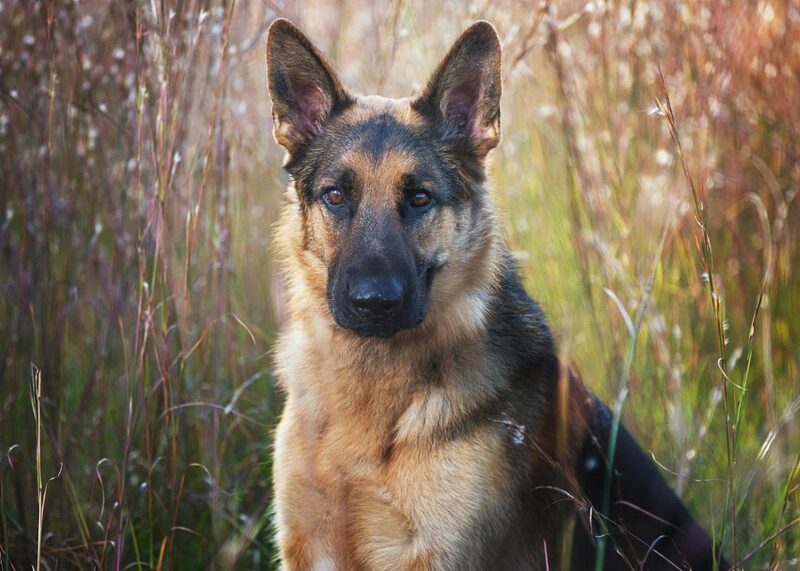 Dogs move quickly and often dont sit for long… especially in a busy park or area with lots of stimuli. I had picked some grass in our path, but not enough clearly. I crouched down and he moved a tad and there it was… grass. I took a “safe shot” to make sure I got him and went back to pick the grass. But as often happens he moved and was “done” sitting for that pose. That’s ok though, nothing that cant be fixed in post…. Ta-Da…. Timber looks perfectly stoic. I removed the blade of grass in front of his eye, I fixed his neck area and fur where the collar pulled a bit and took out his human and the leash. The final step was to adjust the contrast and colors to make his portrait really pop. If you’ve been interested in a pet session and been worried about your dog needing a leash, don’t fret at all. 90% of the dogs in the galleries you’ll see here were on a leash too! Questions, comments? I’d love to hear from you. If you’ve been wanting to set up a session and been afraid, don’t be. 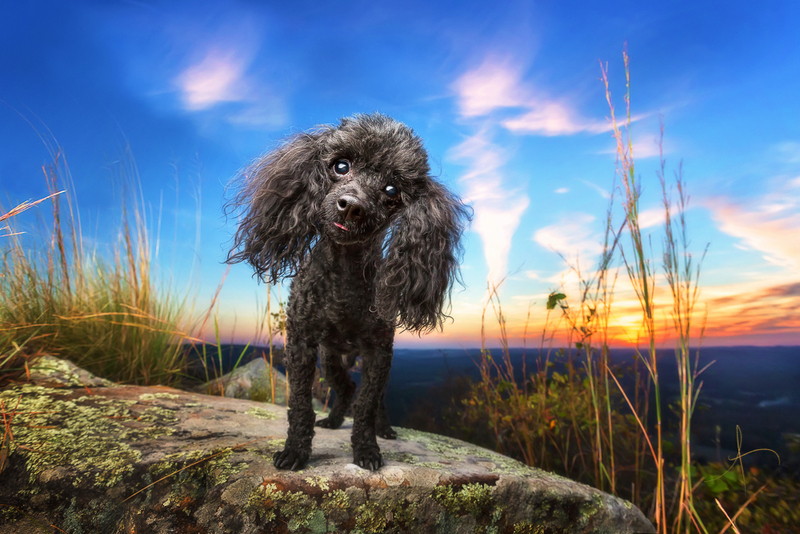 I guarantee to capture your pets unforgettable personality. 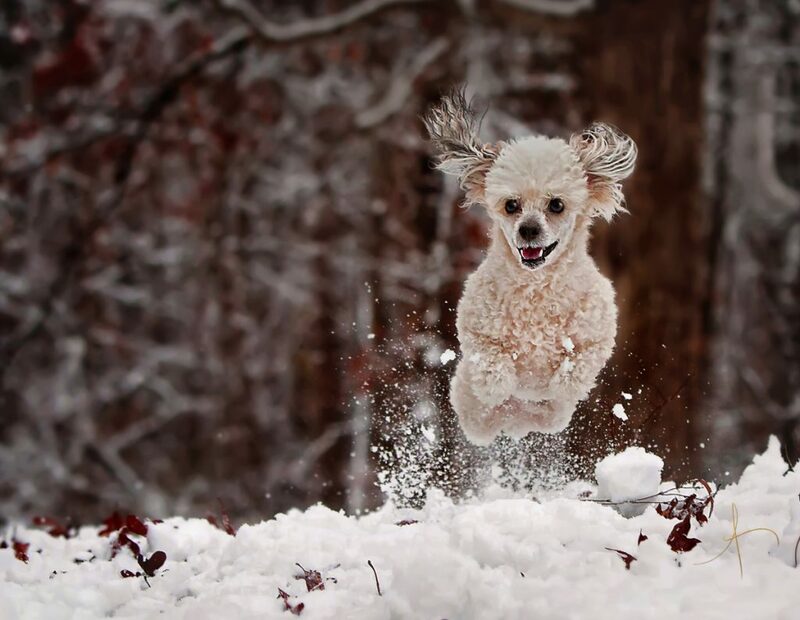 “My dog will never sit still for that”. I hear it all too much! Little do those folks know; no dog sits still! 95% or more of the dog we work with are not trained. So getting an individual portrait may seem like a daunting task, and getting a group portrait may seem impossible. But the GOOD NEWS is: It’s not! We can do it. Take a look at how I created this portrait of my daughter with our dogs (who are totally untrained and wont sit next to her btw). The first step was to create the setting. I picked up this amazing trunk for a great deal at a local antiques store. What a good stroke of luck it matched a blanket that made the prefect Christmas colors. Once I’ve got the setting in mind, I set up the camera and lights. I decide who I want to sit where and I shoot each separately. This may seem like an easy task but it has to be done perfectly or the final image wont merge properly and will look “off” or “photoshopped”. Shooting the images is the easy part, then I take them in to photoshop and start the process of creating the final image from the 3. I shot well so it doesnt take long: a bit of masking to merge the files, retouching on the fur and eyes as well as the baby’s skin and it’s ready to go. The final step was adding texture and finessing colors. Personally, I LOVE adding texture to pieces. It gives it a nice fine art look that I love… and nothing’s finished until it’s printed with a frame, so the last step was to find a nice complimentary gold frame and voila! 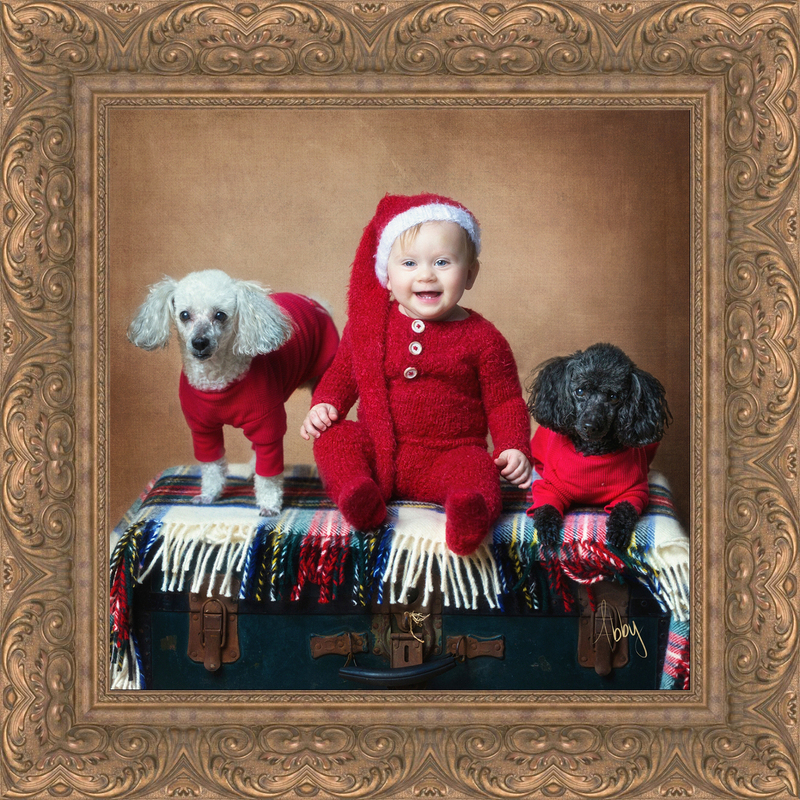 Aurelia’s first Christmas Portrait with the pups. Overall I spent about 30 minutes setting up this shoot and another 30-45 minutes editing and finishing. A lot of work and heart goes in to each portrait we create and it’s alway more than the click of a button. 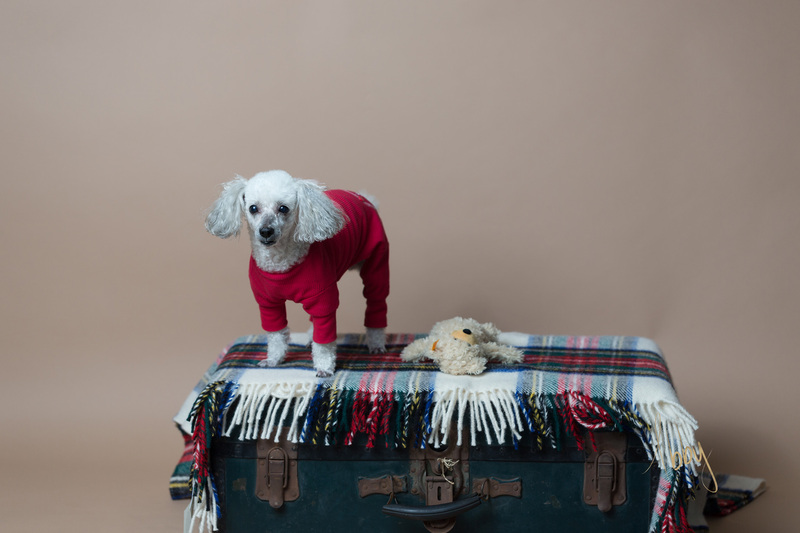 If’ you’ve been on the fence about a pet portrait session and thought “no my dogs wont do it” I hope you’ll reconsider! 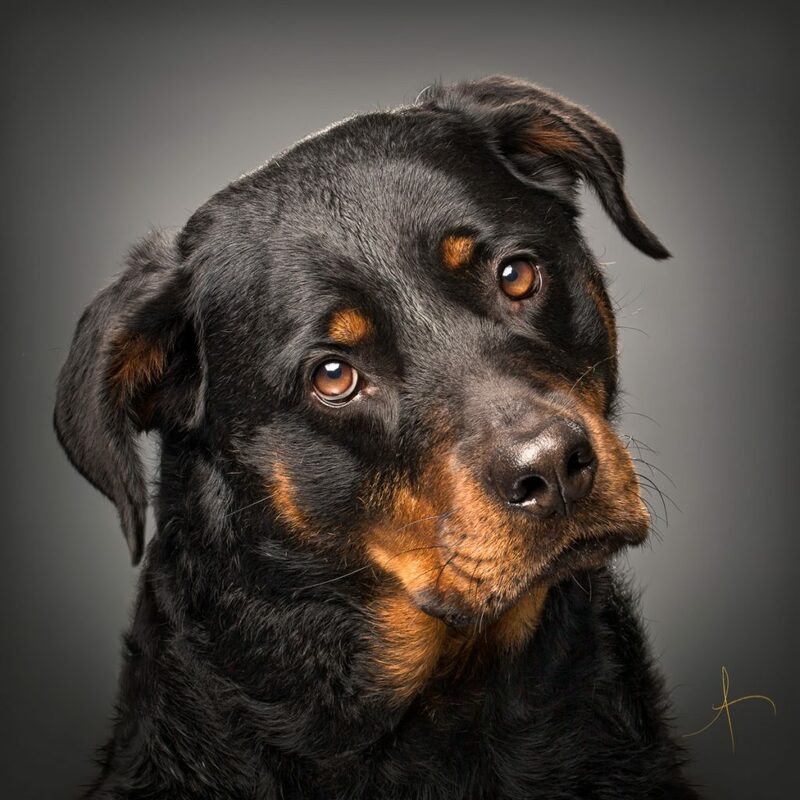 We have an unconditional guarantee that we’ll get amazing images of your dogs! Click here and submit a request to learn more. Step 1, shoot each subject separately. A parent stands by for safety with babies. Finally: Add texture and final edits, Print, Frame and Hang. I get it. 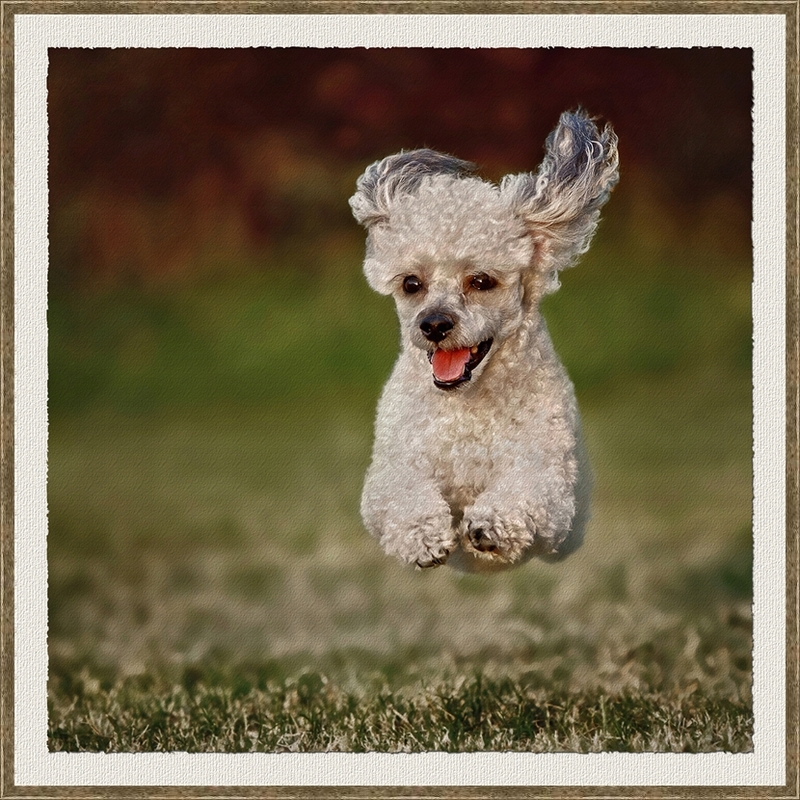 Your dog is super excited about everything and loves to have fun… that’s probably one of the things you love most about them isn’t it. Don’t worry… I totally understand. None of my dogs have any training. 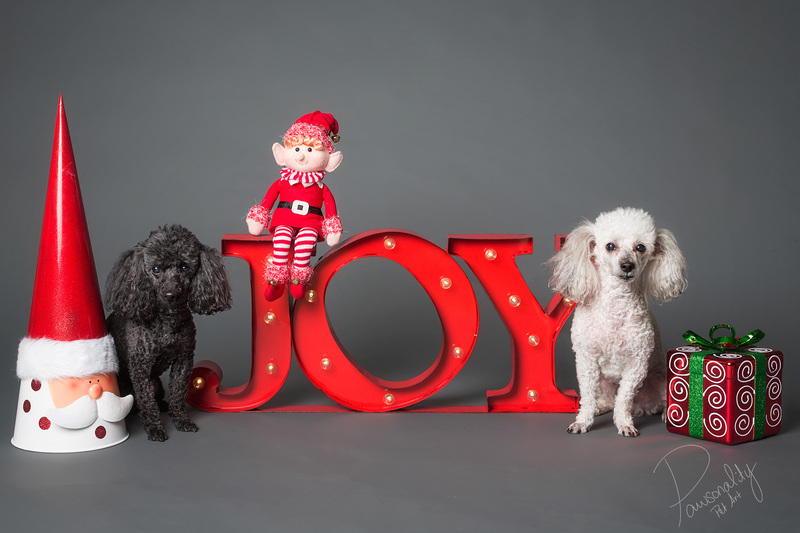 My 2 poodles don’t even know how to sit… and it’s ok. Most dogs we work with don’t have much training, some none at all. In fact some aren’t even used to walking on a leash. Unfortunately many people think this precludes their dog from having a portrait session… and they just don’t give it a second thought. 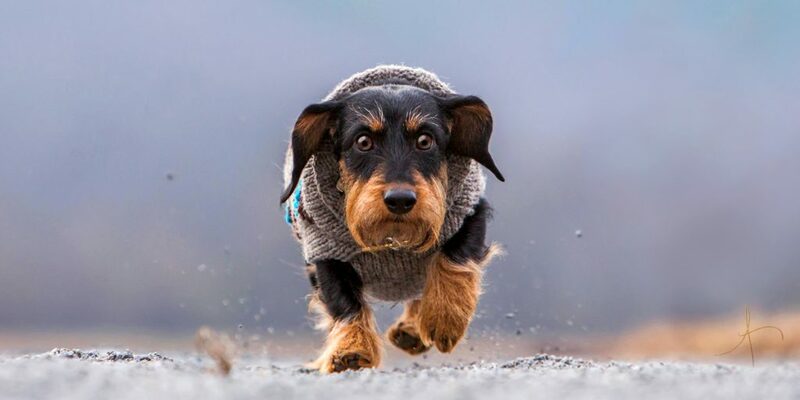 The GOOD NEWS is…It’s OK if your dog is a little crazy! In fact it’s better! Yes, you read that right. IT’S BETTER IF YOUR DOG IS A LITTLE CRAZY. 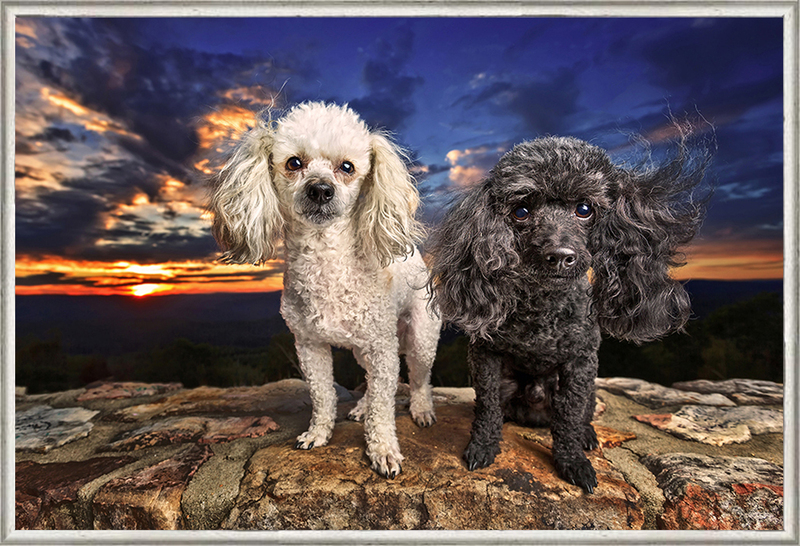 I’ve found happy go lucky crazy dogs do really well in front of the camera and show off their personality really well! And if their happy go lucky personality is what you love about them, shouldn’t it be exactly what we aim to capture in your session? Now a few things we might consider. 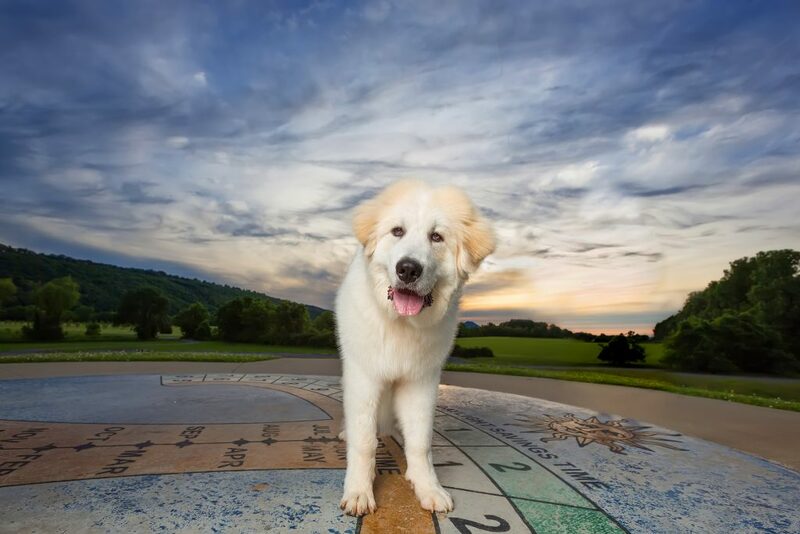 It’s always best to make sure the session takes place at a location that allows your dog to be safe and happy. That might be your back yard or other fenced in area if your dog wants to go off leash and have fun. Inside your home is also an idea. 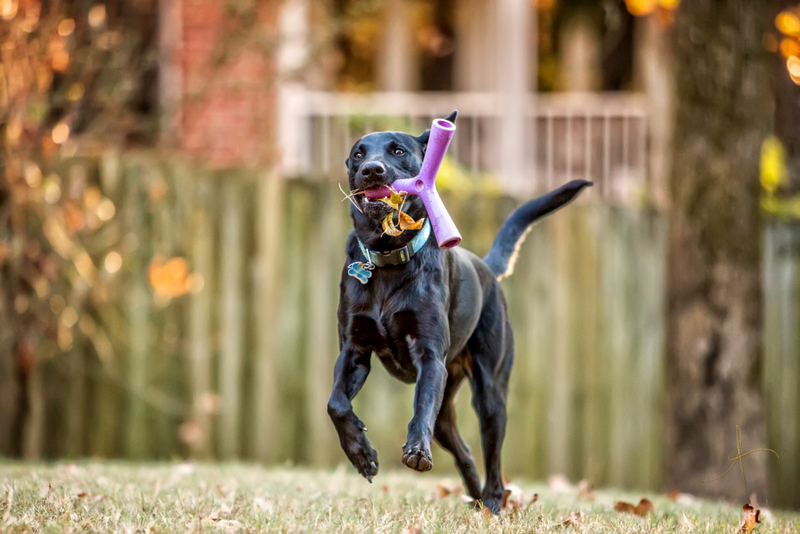 Check out the image of the pup above carrying her toy and a mouth full of leaves… we let her wear herself out playing…she had fun and we got great images! 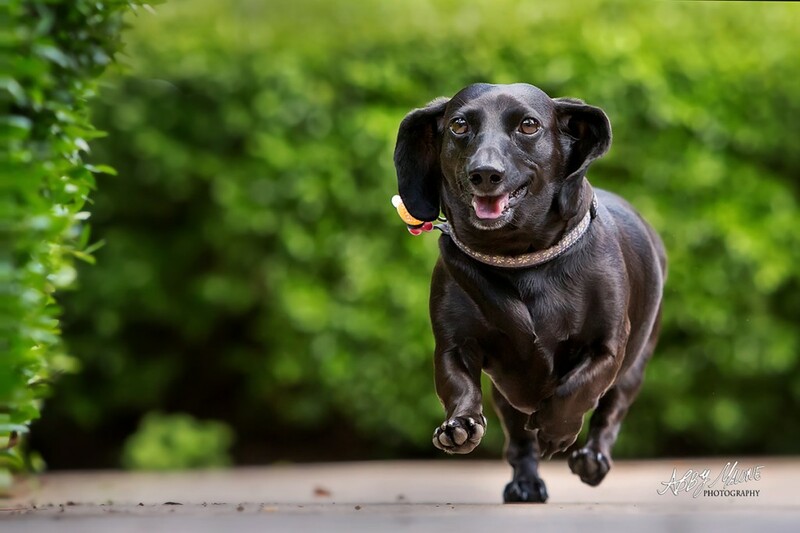 If you do want to go to a park, or live in a condo/ apartment or other setting without a fenced back yard, running in a park on the leash is also possible. This guy had his session in a park. You wouldn’t know by looking but he was on a leash in this image! So if you’ve been worried that your dog will “act up” or “wont do good” because he/ she isn’t trained….PLEASE don’t worry. We have tons of special tricks to get their attention and you will not regret capturing their personality and the reason you really love them. Ready to get started? Have questions/ comments? Contact me any time. Let’s chat. 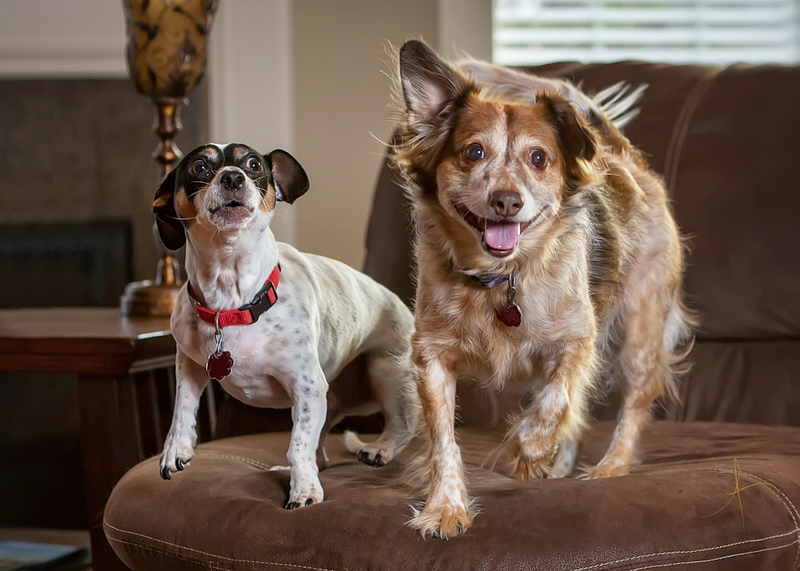 This is one of my favorite images to date: these two bolting off their ottoman in a dash of fun…. Baxter is a rescue. He didnt have much training and you might not know it but he was on a leash here too… He’s ready for a treat can you tell? Lots of personality from this guy in his city shoot. Ready to book your session? Contact me any time… Let’s Chat! The event will take place June 9, beginning at 2 pm. The event will be held at Tyndall Park’s Gene Moss Building. 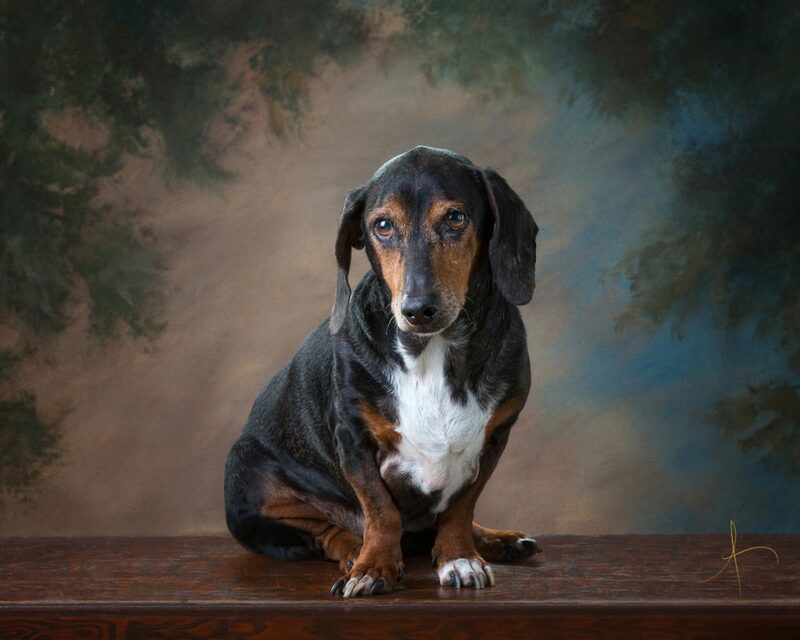 All dogs are welcome to have their portrait taken, even if you are not participating in the beauty pageant. Packages will be available ranging in price from $25-$75. Large print and luxury pet items will also be available. 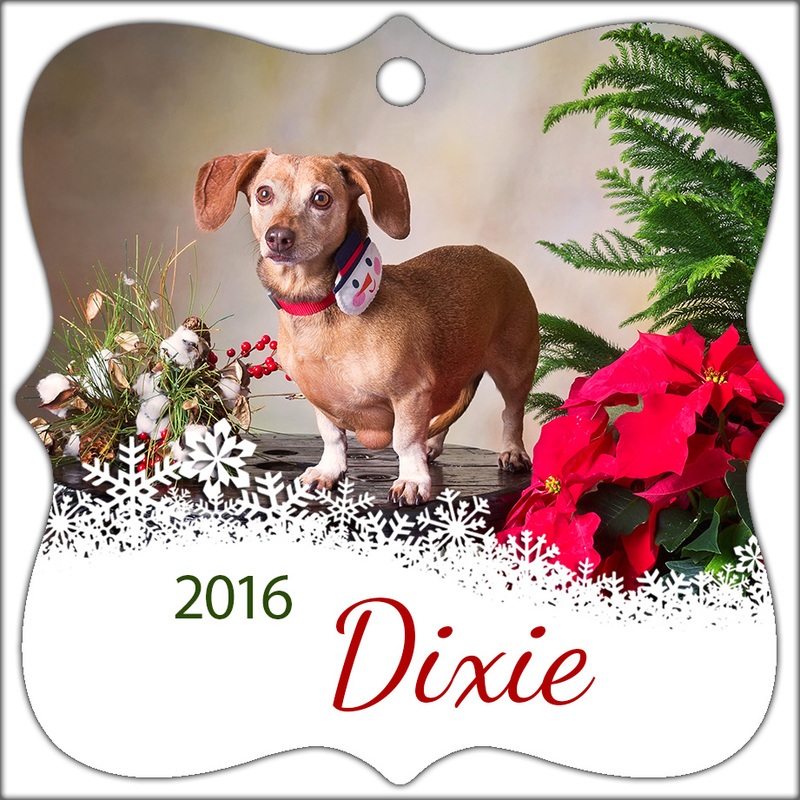 This year, we’ve chosen an off white backdrop to show off all of the color/ clothing/ accessories your pet will likely have in the pageant. If your dog is anxious, or just needs some comfort I’d recommend brining an off white blanket your dog can lay on in the photo. You can bring any toys/ outfits, etc you’d like. Sign Up Below and let us know you are coming & Keep up to date with any info related to the event. 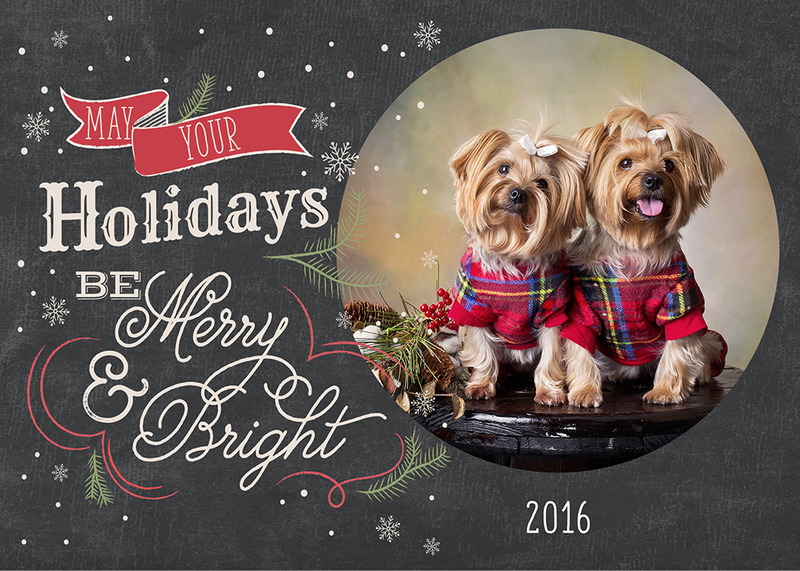 I am so excited to be back at Simply Dogs this year doing holiday pet portraits. Mark your calendars for Sunday, November 26. This year’s theme is Modern Classics. If you like the textured piece at the bottom, that is available as an upgrade for those interested in a more fine art approach. 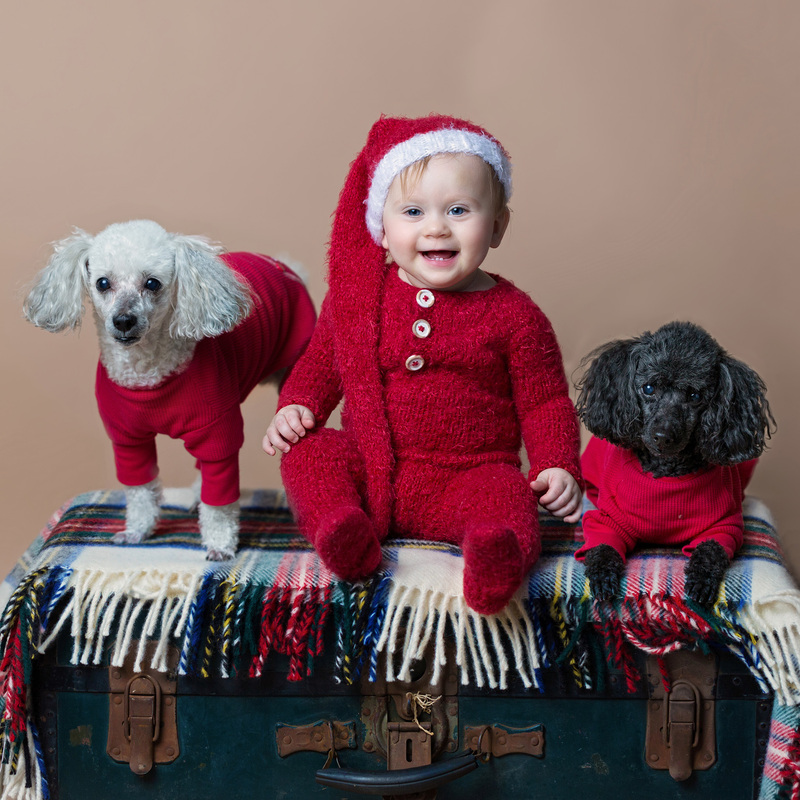 GROUP SHOTS/ MULTIPLE PETS are only accepted as a group photo if the pets are trained to sit and stay. This would most likely mean the dogs have been to a training class. Please do not reserve a group spot if your dogs will not sit and stay on command in any public situation. There is a $35 minimum package order for groups of 2+. 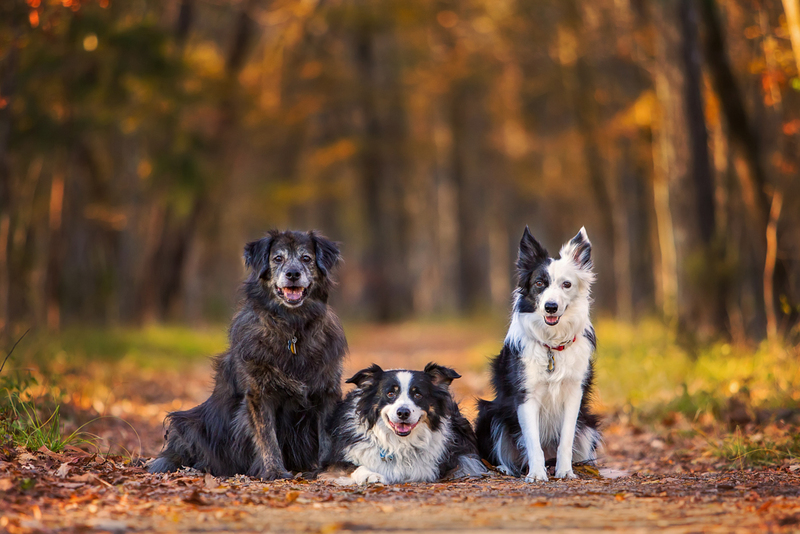 If your pet is not trained to sit/ stay as a group you are welcome to book an individual session for each. The setup will probably only accommodate up to 3 dogs max. 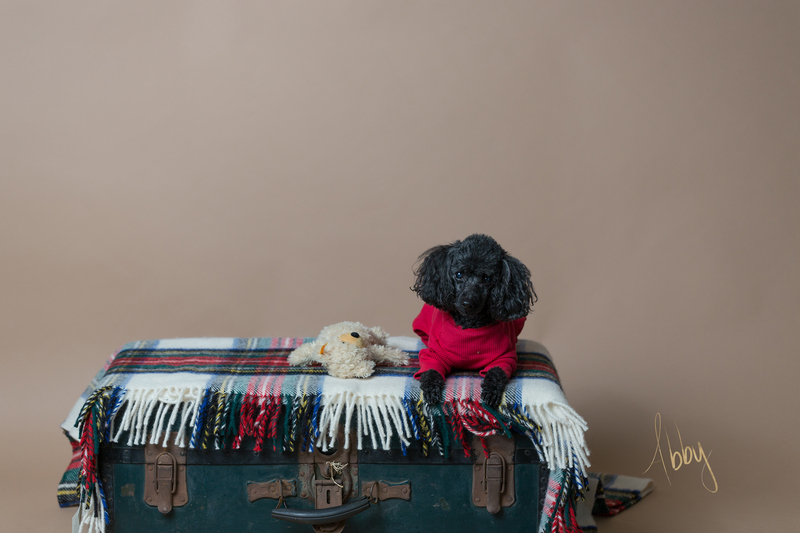 If your dog is a little nervous on hard surfaces, you are welcome to bring a grey blanket to use in the photo for your dog to lay on. You could also consider a dark red. I would recommend something without too bold of a pattern that is not too eye catchy. Sometimes a soft surface helps dogs relax. Feel free to dress your dog in a scarf or something you like if sweaters, scarves etc are your preference. I recommend you try the accessories on first to make sure your dog actually wears it or isn’t nervous by it. Simply Dogs has requested folks make an “appointment” so there is not too long of a line. For images without the joy prop. This card has less space for a photo so it’s best served for something such as a dog posing with 1 prop only and a smaller scene. Note the scene will be the seamless grey paper not the backdrop shown. Note the scene will be the seamless grey paper not the scene shown. We hope to see you there! Any comments, questions? Please send us a message. ….I love photographing cats…. 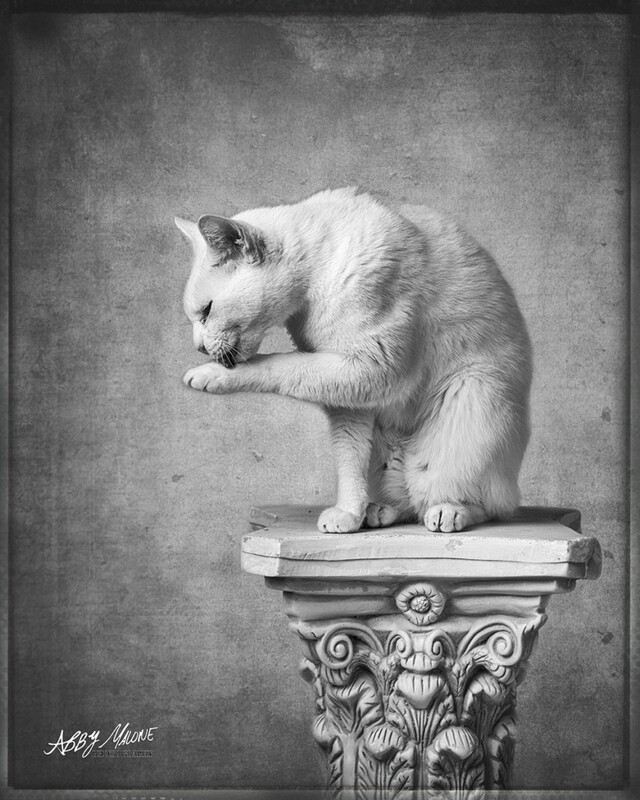 I love it for the challenge for one, as photographing a cat is quite hard, but 2, I love their look… you can see quite a bit of character and pawsonality in each cat… the way they sit, and in their eyes. When I saw Jupiter’s face on the rescue site I knew I HAD to photograph him. He was beautiful. 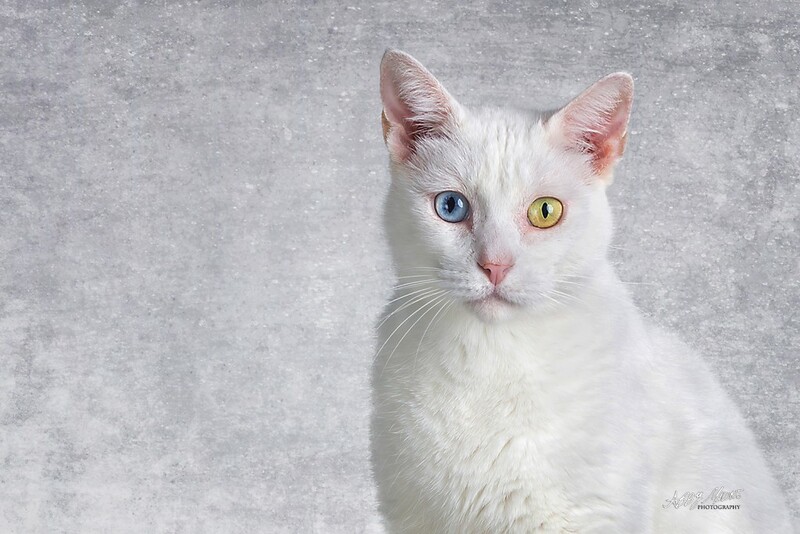 His classically mismatched eyes are stunning. Take a look at my favorite from his session. One of the things I really like about this picture is that I could finally use this podium prop I bought a few years ago. It was finally the right time! And I used some new textures on the background to give it a renaissance feel. I also thought this photo made for a wonderful black and white. I love black and white photos. I caught him licking his paw and, you know, being a cat and doing “cat stuff”. I thought it looked statuesque and almost primal. I knew I’d like it right away in a contrasty and textured black and white. As of now, Jupiter is in foster care at Central Arkansas Rescue Effort (CARE) Headquarters in Little Rock, AR. He is searching for a foster home until he can find a more permanent home. He was initially rescued from the Pine Bluff Animal Shelter. He is very laid back, sweet and kind. 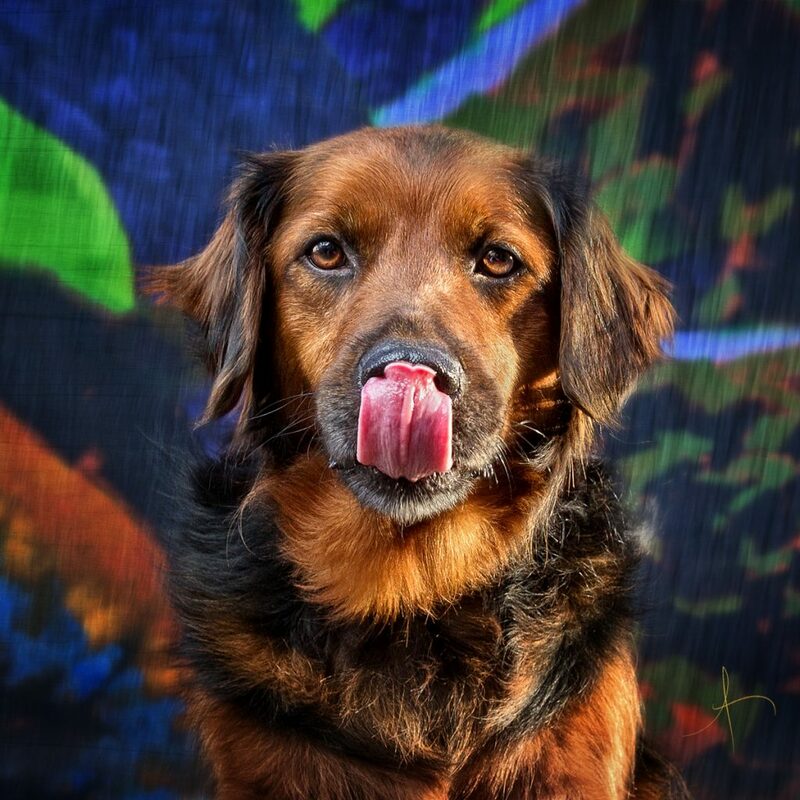 Hopefully with this beautiful photo, they’ll be able to find him a forever home…. 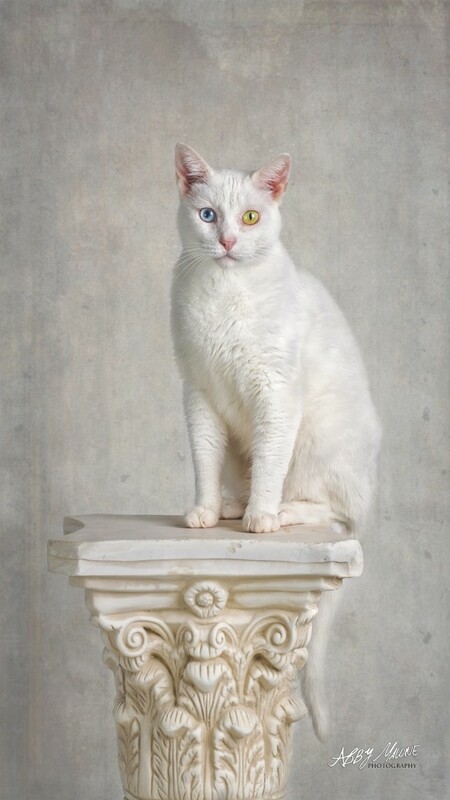 I enjoy using my professional pet photography qualifications and skills to help animals like Jupiter find homes. I am also so very thankful for the wonderful clients I have. 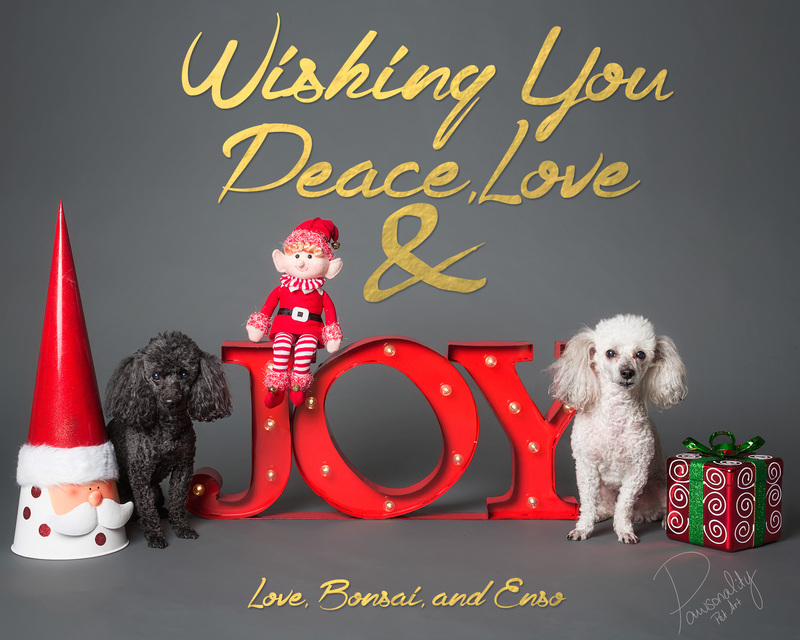 When you book a session with Pawsonality Pet Photography, your support allows me to donate time and more to help animals in desperate need of homes. Thank you. If you are a cat owner and searching for a cat photographer, or professional cat photography for yourself or commercial purposes, I’d love to chat with you, just shoot me an email or give me a shout 5501-749-3814.